Its simple design and proven mechanical advance system make the MT-I extremely depen4able and trouble-free. Its convenient cutting range (from 25 nm to 0.5μm) makes the instrument ideal for both research and teaching. The MT-I has the ability to cut thin and thick sections alternately whenever needed. The MT-I provides uniform sections with little effort a simple turn of the hand wheel advances the specimen toward the knife (glass or diamond). One full turn of the hand wheel moves the cutting arm through one complete cutting cycle. Specimens can be advanced in increments as small as 25 nm. The time-tested SORVALL® driven cutting stroke avoids problems associated with gravity-powered cutting strokes and provides greater latitude for sectioning difficult blocks and non-biological material. Also, the specimen path in the MT-i is a parallelogram which requires the specimen to by-pass the knife during the return portion of the cutting cycle. This simple, effective way of withdrawing the knife from the specimen not only reduces the possibility of damage to specimen or knife but it helps provide the utmost in reliable, service free operation. 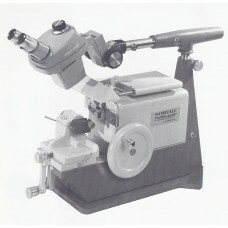 The MT-I comes complete with pivoting telescopic mount and cold light source; mechanical advance system, with sectioning range from 25 nm to 0.5 μm, incorporates by pass for multiple thickness sections; other features include a cantilever arm lock, fine advance marked in 1 μm divisions, 8 mm (5/16 in) collet-type holder, and Knife Holder which accepts glass or standard diamond knives; dust cover, instruction manual. “Thin Sectioning” book and required tools are also included. The MT-1 (Cat. No.15609) is designed for 115V, 50/60 Hz operation. For 22OV operation, a transformer (Cat. No. 04264, or equivalent) is required.